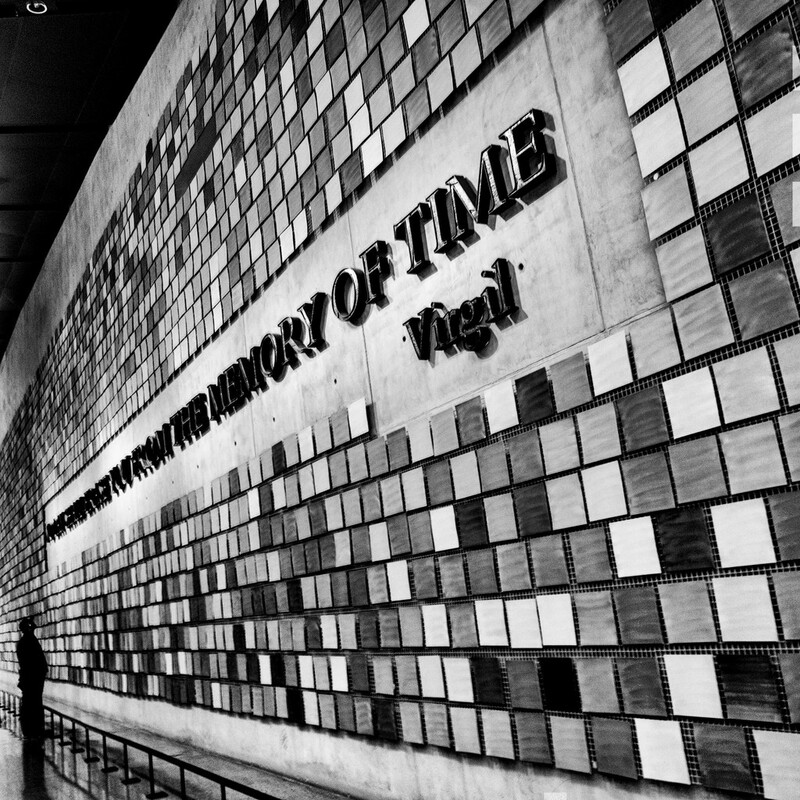 I was rather impressed that the 9/11 memorial contained an art installation whose center is this verse of the Latin poet Virgil: "No day shall erase you from the memory of time". I bought a mobius sterling silver bracelet when I visited there in 2014 with this verse on it...one of my favorite pieces. Great sense of scale with the person. Those are some powerful words and make this image strong and meaningful and a day the world will never forget. Beautiful image and I like your POV. Great quote and shot. I like it in B&W! @louannwarren Indeed, visiting the memorial is a strong experience! @jgpittenger Thank you a lot, also on behalf of Mr. Virgil! @yaorenliu Thank you so much! @jenp Sadly no, we must never forget. Thanks! @kwind Thank you very much! @golftragic Thanks a lot, Marnie! @gardenfolk An interesting read. Only, I think Mrs. Alexander did not consider at all the metaphor, intrinsic of the poem. The columnist seems to think that Virgil just wrote a line on two soldiers/companions/lovers who died in action, not a poem that seeks the very substance of humankind. Don't know, like saying that "Oedipus Rex" is a story about an orphan... Please, continue loving the quote: it talks about love, friendship and misfortune, and I can't see which of those concepts should not apply to those - civilians, policemen or firemen - who lost their lives on 9/11. @overalvandaan Thanks a lot, Saxa! Very poignant - especially with observer.